Private William Richard Parsons, 22227 of B Company, 1st Battalion Dorsetshire Regiment, was killed in action on 3rd April 1917. We start the family with William’s parents: Benjamin Richard and Emily (née King). We know little of Emily. She was born in 1866 at Woodlands St. Mary—a scattering of a few homes in the countryside near Lambourn, Berkshire, mid-way between Swindon and Newbury. The family is absent from the 1871 Census and by that of 1881 she had moved away from the parental home and is recorded as a domestic servant in Tottenham, London. 1891 sees her still in service but as a cook to a surgeon at 24 Saville Row, Westminster. She married Benjamin two years later, in Portsmouth. He was a merchant seaman, born in Itchenor, a small village on Selsey Bill, near Bognor Regis, Sussex, and was the son of a master mariner. By the time of the 1911 Census, the family are living in the Newtown area of Gosport. This is separated from Portsea Island (the main island of Portsmouth, where they had lived previously) by the mouth of Portsmouth harbour. Benjamin, as head of the household, is listed as ‘Mariner on Yacht’. All the children are simply recorded as ‘School’. William is 15 and if he were to become a Pupil-teacher, he would presumably have done so at the end of the 1910-1911 academic year, before turning 16. A different war but an unchanged view: a photograph of WWII evacuees taken from Newtown Boys School. Copyright unknown. We don’t know for certain which school the children attended but for William and his brothers the only school within easy walking distance was Newtown Boys School, Joseph Street, with a capacity of 290 children and average attendance of 240.2 Frank Edward Gregory was the headmaster from 1900 to 1934. It can’t have been an entirely pleasant school for the staff as it was in ‘a condemned, unsuitable building, with the monotonous clang of the anvil and the pungent smell of burning hoof from the smithy on the opposite side of the street.’ 3 However, the latter observation is made from an adult’s perspective; often such distractions, sounds and smells are exciting diversions for a child and the stuff of potent and happy memories. It is likely that William would have attended a secondary school: the old route into the teaching profession through working as a pupil-teacher was being closed off. We do not know which school he attended. In order to gain entry into a teacher training college—a prerequisite to becoming a Certificated Teacher—he would have sat the Preliminary Examination for the Elementary School Teachers’ Certificate examinations. These comprised two parts: compulsory subjects in Part 1 needed to be passed before continuing onto Part 2. In the second part, there were compulsory subjects English, History and Geography, together with three electives from the following broad subject areas: Elementary Science, Elementary Mathematics, and Foreign Languages. At the age of eighteen, William, having passed his exams and secured his place, prepared to start student life at Winchester Training College. Britain declared war on Germany at 7pm on the fourth of August, 1914. William’s expectations of study at Winchester were thrown in the air and the start of his first term’s study at Winchester, less than one month off, was in doubt. Because of this disturbance of College life, the student publication, The Wintonian, ceased to be published and therefore we have no window on William’s life at Exeter. There was a special War Supplement published in 1916 which mainly carried details of students in military service. It lists William amongst the 1916 leavers7 as simply ‘Pte., 3rd Hants Battalion, Portsmouth’. Brief as this is, it is welcome piece of information. We are hampered in tracking his Army service by the absence of his Soldier’s Records. It is quite usual for a soldier’s main bundle of papers to be missing: most were destroyed in the Second World War when an enemy incendiary device landed on the storage warehouse during the Blitz. However, ledgers and indexes existed elsewhere, which often helps reconstruction. His entry in a Soldiers’ Effects ledger tells us that on his death his mother, as next of kin, was due a War Gratuity payment of £5 0s. This amount is related to his length of service and is commensurate with an enlistment date sometime in the month following 4th December 1915. His Hampshire Regimental Number (21869) further narrows this to December 4th to 13th as the numbers were issued in series and soldiers with close numbers and known enlistment dates give us the approximate range of dates. As already stated, William enlisted in the 3rd Battalion Royal Hampshire Regiment. This was not a front-line unit but a Reserve Battalion. The men were held in England (the college record has him in Portsmouth in June 1916) where they were trained and then dispersed to strengthen depleted front-line Battalions as needed. It is therefore no surprise to find that William is listed as having been active in a second Battalion: 1st Battalion Dorsetshire Regiment (Regimental Number 22227). .
We have no firm evidence of when this transfer took place but again his new Regimental Number is helpful. Some records survive of other men with proximal numbers (22207, 22230 and 22252) and these were all 3rd Hants soldiers who had been transferred to 1st Dorsets. All records tell the same story: the men (still in 3rd Hants) embarked at Southampton on 1st July and the following day were in 3rd Infantry Base Depot—a holding camp for reserves—near Rouen. On 15th July they received orders that they would join the new unit “In the field” and all records then carry the same words: “1st Dorsets. Joined Battalion, 17.7.16”. Additionally, the 1st Dorsets War Diary for that day tells us, “Re-inforcement [sic] of 294 Other Ranks joined.” At this point, the Base Depots were unable to maintain adequate supplies of men to the front due to the huge losses being sustained. In general terms, we know that his Battalion was in action from July 1916 in the Battle of the Somme near Authuille Wood. Fifty-one men died on the first day and, over the first three days of the offensive, 501 men of the Battalion were killed, wounded or missing.8 After several more days of heavy losses, they were withdrawn until they were back to strength in October. November 1916 saw them again engaged on the Somme, near the close of the Battle, fighting near Beaumont Hamel. His body lies buried at Chapele British Cemetery, Holnon, Departement de l’Aisne, Picardie, France. Christ Church, Gosport, A History Founded 1839 in Cathedral Close, Exeter. Moving to Heavitree Road in 1854 it became known as St. Luke’s College it was eventually incorporated into Exeter University in 1978. A History of King Alfred’s College, Winchester 1840-1980 by Martial Rose. pp.77-78 In the early months of the War, the College Company was billeted there, followed by various Battalions, through to November 1915. Thereafter the Army Pay Department occupied all of the buildings apart from the Principal’s Lodge, the Library and the Chapel This refers to the expected year of completion of study, not actual. It is dated June 1916, which is before the end of the 1916 academic year. There are students listed still in their ‘Leaving Year’ group who had enlisted part-way through their course. This last date is usually carried on the Medal Index Card. It was not recorded on William’s. A typical infantry Battalion would consist of around 1,000 men, including 30 officers The death or wounding of Commissioned officers was often recorded by name. Non-Commissioned Officers and Privates were rarely accorded such honour. Civil, G. (2009). Christ Church, Gosport, A History. [PDF] Gosport: Kemp Brothers and Wootton, Ltd. Available at: http://www.christchurchgosport.co.uk/wp-content/uploads/2012/10/christ_church_history.pdf 1/3/2018 [Accessed 2018]. Erger.co.uk (2018). 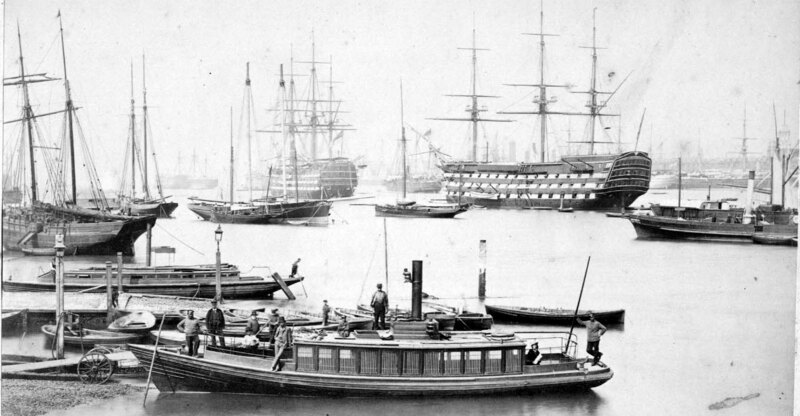 Ships in portsmouth Harbour, Gosport, around 1890. [online] Available at: http://www.erger.org.uk/pics/Ships1.jpg [Accessed 2 March 2018]. Gosport Society (2018) Newtown Boys School. [online] Available at: https://www.gosportsociety.co.uk/Batch%204%20117.jpg [Accessed 2 March 2018]. The Keep Military Museum (2018). The 1st Battalion The Dorsetshire Regiment in World War One. [online] Available at: http://www.keepmilitarymuseum.org/history/first+world+war/the+dorsetshire+regiment/the+first+battalion [Accessed 2018]. Kelly’s Directory (1911). Kelly’s Directory of Hampshire, Wiltshire, Dorsetshire, The Isle of Wight and The Channel Islands, 1911. [online] Available at: http://specialcollections.le.ac.uk/cdm/landingpage/collection/p16445coll4 [Accessed 2018]. Wikimedia (2014). File:The Exeter Diocesan Training College. Wood engraving by W.E. Wellcome V0012649.jpg [online] Available at: https://commons.wikimedia.org/wiki/File:The_Exeter_Diocesan_Training_College._Wood_engraving_by_W.E._Wellcome_V0012649.jpg [Accessed 2 March 2018].